Jean-Philippe RAMEAU: Pièces de Clavecin en concerts (1741). Catherine Mackintosh (vln), Laurence Dreyfus (vdg), Ketil Haugsand (hpschd). Simax PSC 1095 (http://www.simax.no/). Distributed in the US by Premiere Music Distributors (http://www.premieremusic.net/). Mackintosh fronts the Purcell Quartet, Dreyfus leads viol consort Phantasm and Haugsand has recorded decisive Bach. Aided by nearly ideal sonic perspectives, they produce the most lucid PdeCenc I’ve heard (élucider is after all a French verb). Solo leads take wing securely; I’m as impressed by interplay — a unison duo in “La Timide” and resounding “Tambourin” crashes calling for tight teamwork. “La Cupis” (after a dancer pictured in the booklet) is spun out movingly on violin, then gamba. 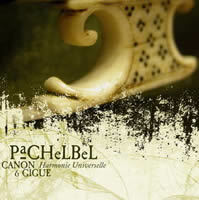 Johann PACHELBEL: Canon & Gigue; Musikalische Ergötzung Nos. I-VI (c. 1695); Partie à 4 (G major, F-sharp minor); Partie à 5 (G major). Harmonie Universelle, Florian Deuter (dir.). Eloquentia EL 0606 (http://www.eloquentia.fr/). Distributed in the US by Harmonia Mundi (http://www.harmoniamundi.com/). Except for the inevitable Canon & Gigue, everything here develops similarly — a string of brief, contrasting dance movements. The six Musikalische Ergötzung apply mild scordatura tunings to the violin (Biber this isn’t), and two violas lend the Parties (Suites) à 4 a darker sonority. Harmonie Universelle, a young period-instruments outfit, is assured and expressive. (Their lovely, unsticky Sarabandes stay in the mind.) Still, Reinhard Goebel / MAK took many more risks 25 years ago. Antonio CALDARA: Medea in Corinto (1711? ); Soffri, mio caro Alcino (1715); D’improvviso (1712); Vicino a un rivoletto (1729); Sonata da camera, Op. 2 No. 3 (1699); Sonata a tre, Op. 1 No. 5 (1693). Gérard Lesne (alto), Il Seminario musicale. 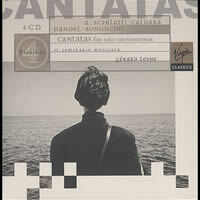 Virgin VC 7 91479-2 (1991, O/P), Virgin VBD 5 62247-2 (disc 2 of 4) (http://www.emiclassics.com/). This chamber CD is on its third life — long may it spin. Lesne’s alto has agility (what exact trilling! ), altitude and bite, and prominent Early Musicke players boost Il Seminario musicale. 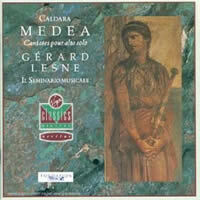 The irate drama of Medea in Corinto stands apart from the other cantatas, which plot a less agitated and pastoral route through romantic attraction. Two sonatas are meant as entractes but seem rather more — the prevailing Corellian manner is stiffened by Caldara’s gift for “old-fashioned” counterpoint. 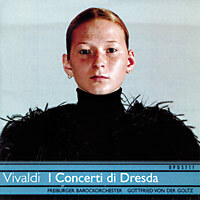 “I Concerti di Dresda.” Antonio VIVALDI: Concertos in G minor, RV 577; F major, RV 569; G minor, RV 576; F major, RV 574 (all c. 1716); Sinfonia in C major, RV 192. Freiburger Barockorchester, Gottfried von der Goltz (dir.). Opus 111 OP 30283 (http://www.naive.fr/). Distributed in the US by Naxos (http://www.naxos.com/). Subtitled per l’orchestra di Dresda, RV 577 has been a favorite since Hans Stadlmair’s long-ago DG Archiv account. The impatient “cutting” between violin and pairs of flutes and oboes packs lots of invention into 9:33. Its companion RV 576 is nearly as fine, without quite the same whirligig motion. The F major works replace the flutes with horns, and images of the hunt vie with other solo cells. The Freiburgers display their usual attack and panache, in exceptional sound. Johann Sebastian BACH: The Art of Fugue, BWV 1080 (1740-45, 1748-50); Concertos after Ernst (BWV 592) and Vivaldi (BWV 593, 594, 596). Lionel Rogg (Metzler organ at Cathedral of St. Peter, Geneva; Marcussen organ at St. Nicholas Church, Åbenrå, Denmark). 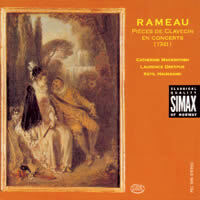 EMI 3 81766 2 (2 discs) (http://www.emiclassics.com/). 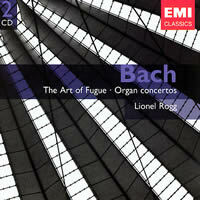 I’ve been waiting for this 1969 Art of Fugue to reach CD since the format’s inception (the coupling, Bach’s apprentice organ-izing of Baroque concertos, is perverse). Much of Rogg’s Art is agreeably nimble. Changes in registration and tempo highlight structures, and mirror fugue XVI’s regular and inverted forms take an identical 2:34. Rogg saves his firepower for the unfinished finale, stopping when the score does, then replaying it with his own conclusion (only 1:26 long and fitting seamlessly).